The Health and Safety (Safety Signs and Signals) Regulations 1996 makes it a requirement for businesses to have fire action signs in the workplace. 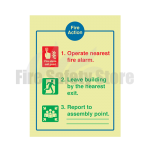 They are designed to outline standard fire evacuation procedure in the event of a fire, instructing not just staff but potential customers or visitors. These fire action signs are a crucial requirement and here at Fire Safety we stock a wide range to suit your business. Our fire action signs are available in photoluminescent and glow in the dark. The signs are made from a rigid plastic so they can withstand damage in even the harshest environment. Also available are prestige signs which are high quality signs. 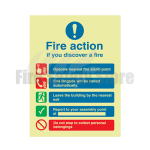 Our fire action notices range from staff instructions to general public directions. Some signs also include what not to do as well as what people such as staff and visitors should do in the event of a fire.